The In Situ Soil Mixing technique is also known as Cutter Soil Mixing (CSM). Its technological origin was in 1954 in the U.S., where a screw type mixer was used to mix soil and cement. The deep mixing technique was further developed and was presented for the first time in an international conference in 1975 by two projects, one Swedish, the other Japanese. Deep mixing was very successful in Japan, and the method rapidly evolved after 1980, allowing many companies to fine tune their own versions of the process and to elaborate an extensive variety of techniques. Drilling rig with Cutting and Mixing Head / Soil sample. The Cutter Soil Mixing (CSM) process consists of the onsite construction of impermeable panels whose geometry is similar to that of a diaphragm wall. 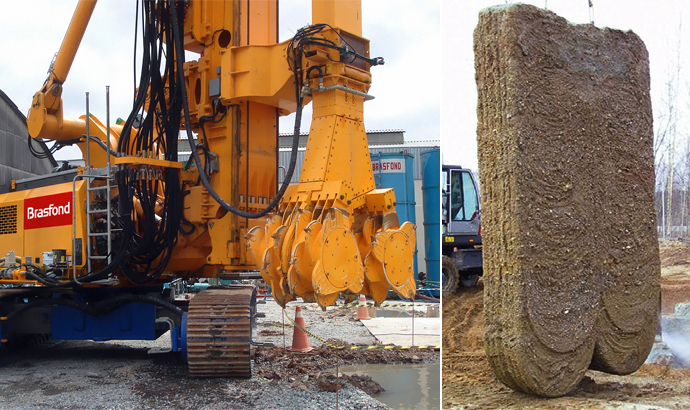 The distinct difference between the Cutter Soil Mixing (CSM) System and other techniques is that there is no soil removed. When working in a contaminated area, the soil is neutralized by the addition of Portland cement or other chemical substances thus saving time and money in transport and treatment at a hazardous treatment facility. A homogeneous structure consisting of soil and cement. Specifications, construction sequences, equipments and applications.